Iran's Press TV scored an international scoop Tuesday. It turns out, it reports, the massacre of 20 schoolchildren and six of their teachers and administrators was not the work of a troubled loner. Rather, it was Israeli death squads exacting vengeance over a recent United Nations General Assembly vote granting Palestine nonmember observer status. In a time of national grieving unmatched since the 9/11 attacks, the Iranian government's English-language news outlet used the opportunity to promote vile anti-Semitic conspiracies so extreme that not even the most strident Islamists have offered anything close to them. The claim came from Michael Harris, who was one of three panelists in a discussion about the massacre at Sandy Hook Elementary School in Newtown, Conn. While the other panelists focused on a culture of violence in America, or the issue of gun laws, Harris unleashed a torrent of Jew hatred. "Hollywood is Jewish owned and Jewish controlled and they spew filth and they spew violence out," he said. Jews are the ones pushing for gun control. Jews control Congress. "And now here we go, here's a revenge killing in the U.S., sponsored by Israel, that killed all these innocent children," Harris said. "And that is something that Israelis do very, very well. They target the innocent, they target children, they target women and they avoid the issue. Because they're angry they didn't get their way and now Palestine has standing in the U.N. and Israel is going to be subject to the International Criminal Court and their leadership is going to be taken to task. So let's connect the dots here about what's going on globally, geo-politically with Israel involved." While the other two guests dismissed Harris' theories, saying Israel had nothing to do with Newtown and tried to steer the conversation back to the brutal killing, the Press TV hostess never pushed back. A video of the segment shows Harris spoke longer than the others during the 25-minute segment and was given the last word. The United States considers Iran the world's leading state-sponsor of international terrorism. But that fact hasn't stopped American Islamists, led by officials from the Council on American-Islamic Relations (CAIR) from repeatedly appearing on Press TV programs to bash American policy or culture. It might be different if they tried to speak truth to power, criticizing Iran for its terror support or repression of its own people. But instead, they have blamed America for Muslim riots over the Internet video mocking Mohammed last fall. They have cast America as being at war with Islam, a message considered to be one of the most potent tools in recruiting Muslims to violent jihad, and likened America's treatment of Muslims to the way Jews were treated in Nazi Germany. Examples go on and on. They grant legitimacy to a broadcast outlet pushing conspiracy theories like a modern Protocols of the Elders of Zion. 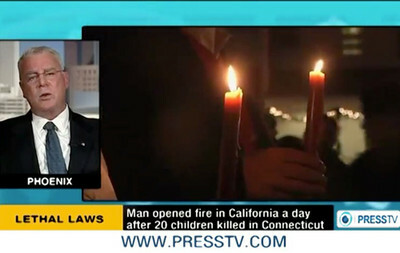 Press TV followed up the Newtown panel discussion by publishing a story on Harris' theory on its website. "Israeli death squads involved in Sandy Hook bloodbath: Intelligence analyst," the headline blares. It describes Harris as "a former Republican candidate for governor of Arizona and GOP campaign finance chairman." The Press TV article asserts Israel staged the attack "to teach America a lesson, knowing that America would take the punishment, keep 'quiet,' and let a 'fall guy' take the blame." If the publishing of cartoons and Internet videos depicting the Muslim prophet Muhammad can spark riots and killings throughout the world, what does a blood libel like the Sandy Hook conspiracy theory do to Muslim attitudes toward Jews? Blaming Zionists and blaming Jews for problems large and small is a reflex action in parts of the Middle East, including claims Jews were behind the 9/11 attacks. Hamas instills it in young children. Islamists in Egypt blamed Jews for a New Year's Eve 2011 bombing at a Coptic church that killed 21 people, a message echoed by Press TV. The article on the Newtown shooting was written by Gordon Duff, identified as "a Marine Vietnam veteran, a combat infantryman, and Senior Editor at Veterans Today." Harris also writes for Veterans Today, including articles defending David Duke as "a shining example of western freedom and democracy." Another article details his suspicions that Jews, what he calls "organized jewery" was behind Jared Loughner's shooting attack in Tucson that wounded U.S. Rep. Gabrielle Giffords and killed six people, including U.S. District Judge John Roll. "My point here is: will organized jewery, the Neo-Pharisees that comprise the unelected criminal shadow government sacrifice an asset like Congresswoman Giffords to advance their bigger agenda?? You bet they will. The criminals who took down the WTC and the Murrah Building in Oklahoma, will eagerly sacrifice a pawn to pass stricter gun control measures and dis-arm the US population. The armed US population is the biggest obstacle that still exists for the shadow government of the Neo-Pharisees to fully implement a totalitarian state here in the USA, just like they destroyed Czarist Russia and created the Soviet Union, they work day and night to impose that same hell on the citizens of the USA." Press TV officials should have been aware of Harris' views before they invited him on the air and let him unleash his empty conspiracy theories and hate rhetoric. Duff's Press TV article says Harris points to "the flood of inconsistencies in the 'cover story.'" But those amount to a series of unanswered questions about alleged accomplices and unsourced claims that police gunned down the shooter, Adam Lanza, after he tried to surrender. "After Harris' broadcast, key members of the military and law enforcement community contacted Veterans Today in full support of Harris' analysis," Duff writes. "One three star general is quoted as saying, 'Harris hit the nail right on the head and it is about time someone spoke up.'" What other proof is needed? In the broadcast interview, Harris predicted a grand cover-up by Congress, which he said is owned by Zionists. The absence of proof, therefore, is his proof. "So any truth of this, if there's going to be, is going to be hidden because Israel wants it hidden because they are once again the guilty party," Harris said. "You have to realize, Israel has been operating death squads in the United States now since Gabby Giffords and Judge Roll were shot in Tucson. There's been other incidences. The Aurora, Colorado shooting that was, again, Israeli death squads operating in the U.S."
Fellow panelist Raynard Jackson, a Washington-based political consultant, called Harris' comments "irresponsible." A third panelist, Don Debar, said that the United States is the "pre-eminent imperial power in the history of the planet." As such, it controls Israel "although there is some backwash in the Congress and other places." Given the last word, Harris went off on another rant, condemning American drone strikes abroad, which, "again," he said, "it goes back to Israeli influence in U.S. foreign policy." If he had not done so in the previous 20 minutes, he made it clear that he and Iran are on the same page. "And I am very much anti Israel. I want Israel off the face of the earth. They are the source of all problems in the Middle East. They are the original terrorists. And do not forget that this killing in Newton (sic) was a revenge killing because Israel lost the vote about Palestine being recognized in the U.N. That's all it's about. It happens every time. It's Israelis acting out, throwing a fit in extracting revenge upon the United States. "That's exactly what it is. And I'm tired of the kid gloves with Israel. It's time to go bare knuckles with them. Let's go." The Newtown massacre united the country in grief. Press TV allowed Harris to use the tragedy to sow hatred and nonsense. If not for the horrible nature of the subject, it might have been taken as performance art, mocking the crazed and illogical nature of bigotry. Instead, it's a clear definition of what Press TV seeks to accomplish. American Islamists, and those who work with them, should consider this the next time Press TV calls.